We’ve had gorgeous weather here in Germany, and I’ve spent a lot of time sitting in the shade on my terrace. The fruits and vegetables offered at the supermarket are much nicer than they were only a couple of weeks ago, and I’m really looking forward to asparagus season, and freshly harvested potatoes. And eating spring vegetables means that the riches of summer are no longer that far away. I can’t wait to make fresh tomato sauce! This year, I am determined to grow a small vegetable garden on my terrace, I’m not exactly known for my gardening skills or beautiful vegetation around our apartment, so the experiment may not turn out very successful, but I at least want to try. 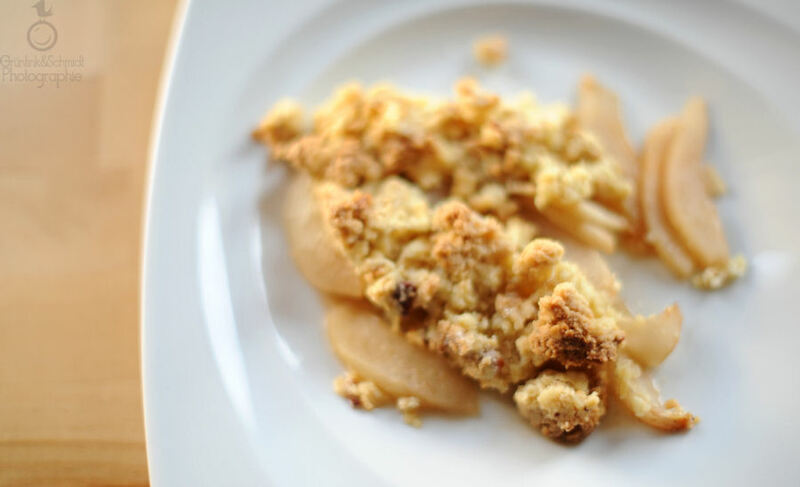 Until spring arrives in full, I’m resorting to making one of my favorite desserts to eat throughout the year (except maybe in summer) about once a week: fruit crumble. It’s a delicious and warm dish, like a Strudel but with a huge serving of fruit topped with crunchy sprinkles (as opposed to a small-ish fruit serving covered in dough). Like strudel, you can serve a crumble with a serving of hot vanilla sauce or a dash of whipped cream. 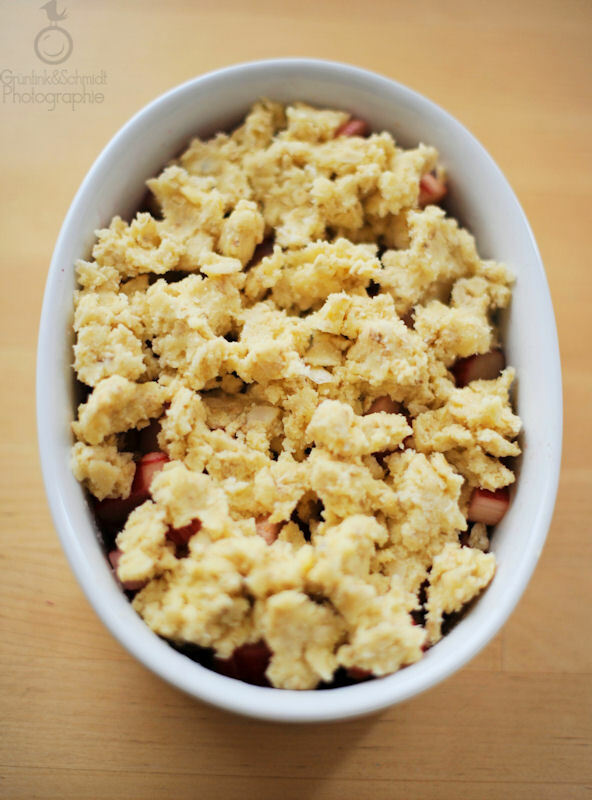 Fruit crumbles are both cheap and ridiculously quick and easy to make. They can be eaten hot or cold, and thus make an ideal contribution for a picnic or as a party. I originally learnt of the existence of crumble at a party back in the day when I was a student. 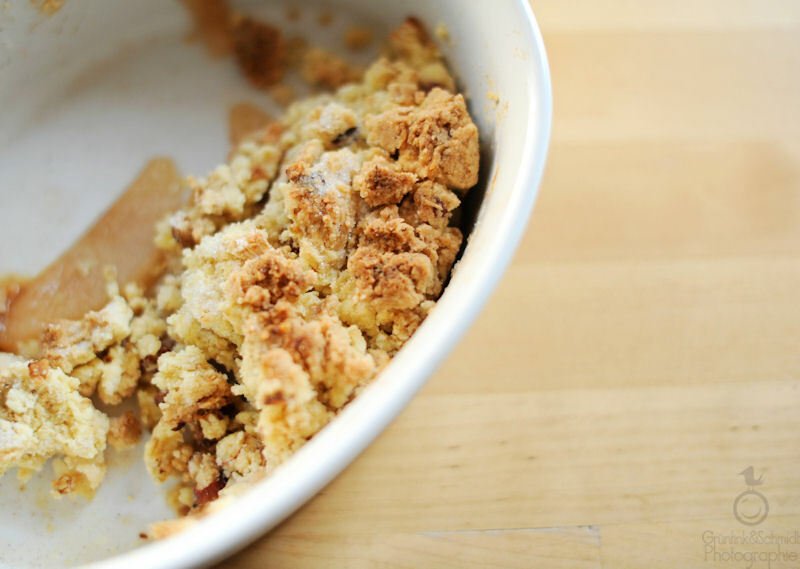 The hosts sister brought an apple crumble and I remember sitting around in the dimly-lit kitchen way after midnight munching away at it together with a friend who ecstatically kept uttering “Apple crrrrrrumble! It’s soooo good!” until we had eaten it all up. 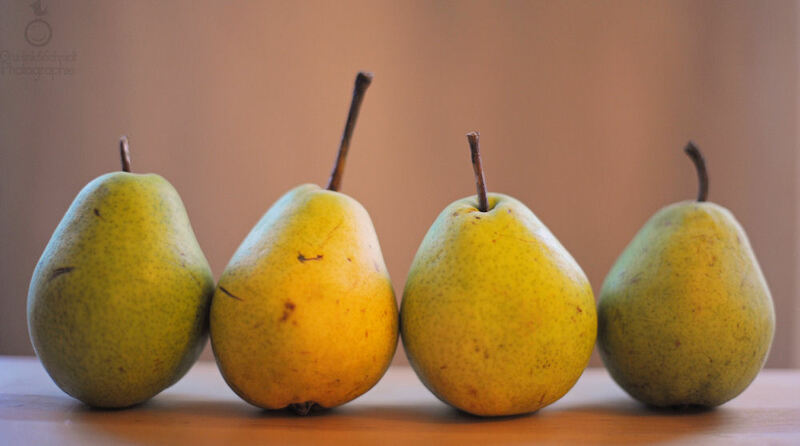 Typically, I make a pear or apple crumble with a generous serving of nuts and a hint of cinnamon. Eating these crumbles makes me feel warm and fuzzy inside, it’s real comfort food. 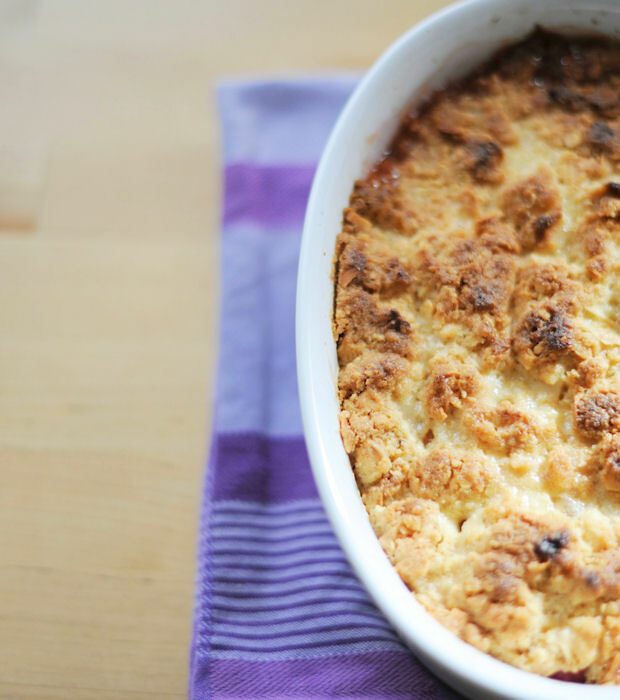 But in spring, when it’s in season, I will make rhubarb crumble, which I believe is the ultimate version of fruit crumble. I love how rhubarb will fold into incredibly soft, creamy compote with a hint of sour, and a hint of sweet. Plus, it’s pink and incredibly pretty and contains lots of vitamin C. For a healthier dessert, I also cook compote out of rhubarb and eat it plain, but only when it’s really cold. So good! This dish can be easily veganized, simply replace the butter with margarine. Making fruit crumbles in a gluten-free version is essentially easy, you just have to be careful about the flour you use. I found that making these with Schaer Farine was less than tasty, so my go-to flour for this project is always Harina de Reposteria by AdPan (which I buy from www.glutyfreeshop.de). If you can’t get this flour or don’t want to, then don’t fret. I suggest mixing your favorite gluten-free flour with ground almonds or other ground nuts, adding a bit of super fine rice flour for fluffiness and adding a bit more butter and baking powder. I am posting this recipe as a part of the “What is your favourite recipe” project initiated by Martin from boncibus.ch, because as I have already described above in great detail, this is clearly one of my favourite recipes for desserts. If I understand correctly, you are supposed to tag another gluten-free blogger, so I’m inviting Trudel Marquardt who is a true superstar in the German gluten-free community as well as my friend – who is also on a gluten-free and vegetarien diet – Sabrina with her (new) Blog Ein Apfel am Tag. 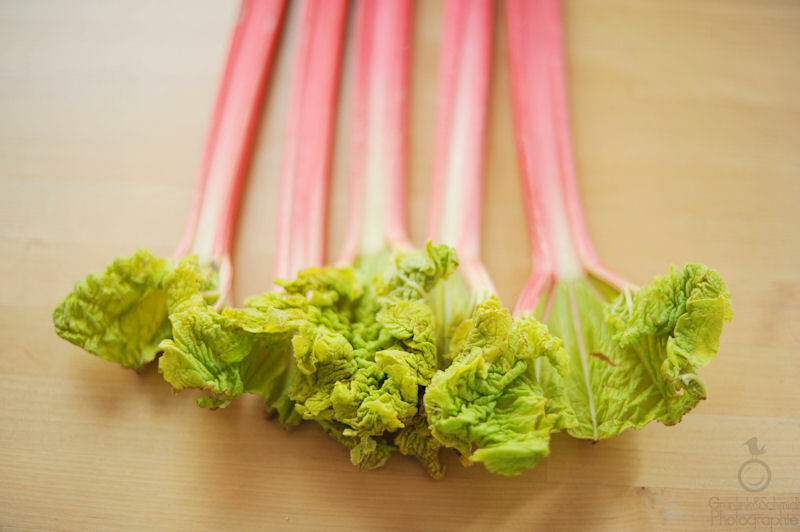 Wash your rhubarb stalks and cut off the leaves on the top and the lower white part that was attached to the roots. 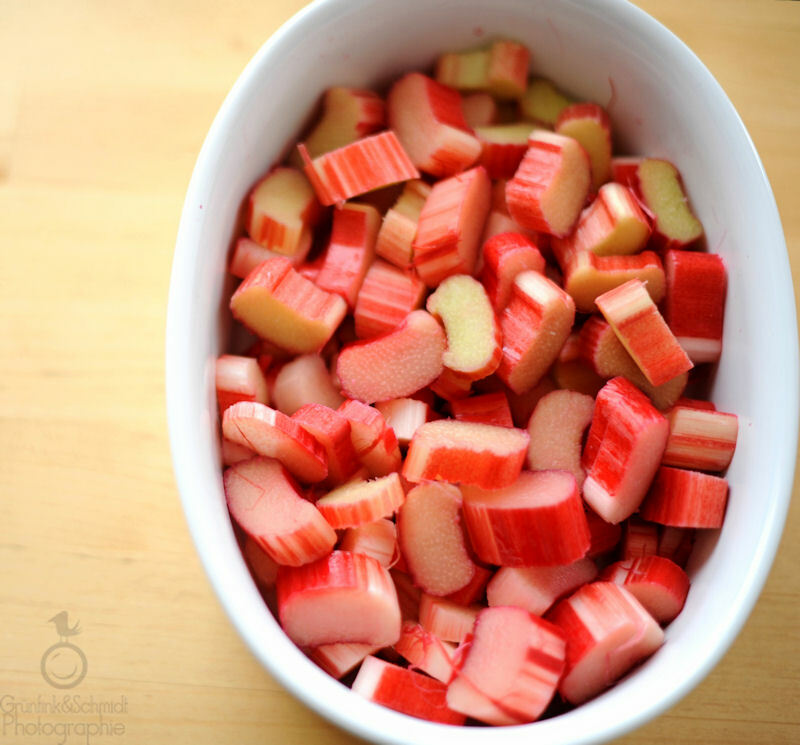 Proceed to cut the rhubarb stalks into small pieces, about as wide as your index finger (ensure all pieces are more or less the same size), and place into an oven dish (no need to grease it). Note: if you make this recipe with apples, peel and cut the apples (or pears) and cut into thin slices, about one cm thick. Some people love to add raisins to their apple crumble, and I also love adding roughly chopped walnuts and hazelnuts. I also add a chunk of melted butter into the apples and distribute it evenly among the slices. This gives them a creamy texture. Add sugar and vanilla essence (maybe cinnamon, maybe lemon peel) and mix until evenly distributed. You can of course pre-cook the rhubarb, but I have not found it necessary. Heat your oven to 200 °C. Place all the dry ingredients in a bowl and proceed to knead into a dry dough. The dough shouldn’t be to greasy (it will not be crunchy) and not too dry (it will end up being a floury mess) either. Tear dough into pieces as you cover the contents of the oven dish entirely in sprinkles. 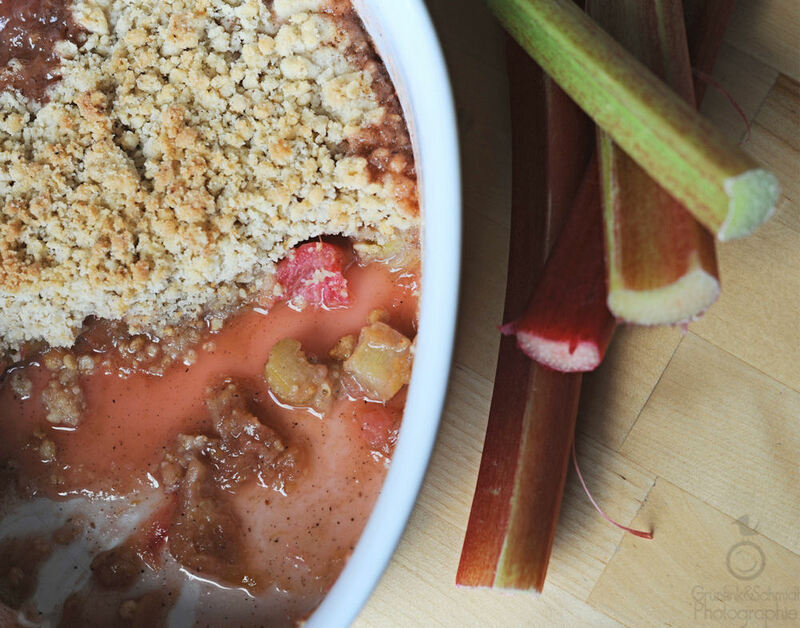 Place rhubarb crumble into the oven, and bake until the crust is golden brown and the rhubarb is throwing bubbles from cooking inside the oven dish. Serve warm or cold, with a serving of hot or cold vanilla sauce. Can be prepared up to a day ahead and kept in the fridge. You can make variations of this dish with other fruits. I may try this with strawberries, apricots or mangoes (if I can actually manage not to eat them up prior to placing them into the oven), perhaps even with a mix of pumpkin and apricots (then going heavy on the spices, perhaps adding some dried fruits such as dates). I hope you enjoy thish dish as much as I do, please let me know if you make it. I’m curious to hear how you liked it and if you dared baking it in a different version.